Review date: 1 June 2000. Most of the world's video card makers have a GeForce2 GTS-based card either on the market already or in the pipeline. NVIDIA's latest chipset continues their leading-edge reputation; it's mind-bendingly fast, highly compatible, and quite reasonably priced when you consider what it can do. 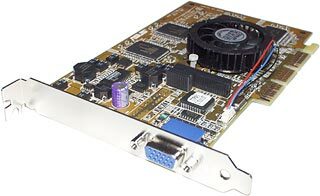 There is, at the moment, nothing on the market that can beat the GeForce2 for consumer PC 3D graphics, though 3dfx will pretty much match it with their upcoming, similarly priced Voodoo 5 cards. "Consumer PC 3D graphics", decoded, means games. Consumer PC 3D boards are engineered for game performance, and can't keep up with professional 3D cards for serious 3D applications - well, not without a total driver rewrite, anyway. On a performance-per-dollar basis, the cutting-edge game cards still put up a very strong showing against the pro boards, but you won't be fooling anybody if you say you've bought a GeForce2 for, uh, advanced turbulence modelling in your, um, study of the hydrodynamics of the blue-ringed octopus. Given the GeForce2's current world-beating status, the question for many buyers isn't what kind of graphics card to buy, but which manufacturer's GeForce2 to go for. I checked out Leadtek's plain-vanilla but excellent WinFast GeForce2 GTS board recently (read the review here), and now the ASUS AGP-V7700 Pure is available in Australia too. The "Pure" in the V7700's name means this card doesn't have any fancy extra connectors; like the Leadtek board I reviewed, it's got a monitor output and that's it. The ASUS board has some significant distinguishing features, though. Not price; the Leadtek card's selling locally for $AU695, and the V7700 Pure costs a not-much-steeper $AU715. But in both hardware and software, this is a significantly different card from the Leadtek. When you've got a chipset that's being used by umpteen companies to make what therefore turn out to be pretty darn similar graphics cards, you end up with only three areas where cards can differ. Price, extras and software. Price is simple enough; when the packages are identical, or the more expensive package doesn't have anything special that you want, pick the cheaper product. Extras are card features beyond the basic model - TV output and input, or special flat panel or 3D glasses connectors. ASUS make "Deluxe" cards with all of these frills, and a substantially higher price tag. But this isn't one of them. Software includes the drivers, and other stuff like DVD playback software and games. Some cards come with funky game bundles. The bundle games typically don't cost the card manufacturer much, but they can carry a rather larger value for the consumer. Assuming, of course, that you actually want the games in the bundle. The V7700 Pure comes with the same bundle as other recent 3D boards from ASUS; you get the increasingly dated games Drakan (dragon-riding fantasy woman - in more ways than one - battles evil) and Rollcage (rambunctious racing). There's also an OK but not very exciting DVD player package, and some demos - but, regrettably, not the quite seriously gob-smacking new GeForce2 demos. All you get are the old GeForce ones, most of which can also be downloaded from here. You can download movies of the various new demos from here, but not the demos themselves; some GeForce2 boards come with them, but the Leadtek and ASUS offerings don't. Curses. The drivers are the most important part of the software collection, especially if you've got a card with non-standard extras. The ASUS board has some interesting twiddly bits, which I'll get to in a moment, but as far as drivers go it's a plain "reference" board. Drivers not provided by the manufacturer of a particular fancy bell-and-whistle-encrusted card probably won't let you use any extra card features. If they're made by another card manufacturer, as opposed to the manufacturer of the chipset the cards share, they probably won't work at all. This is the case with the ASUS and Leadtek boards, for instance. Both of them will work with NVIDIA's plain driver sets, or with the drivers provided by their manufacturer, but neither of them'll work with the other manufacturer's driver set. Which is significant, because as it turned out, I'd rather have liked to use the ASUS board with the Leadtek drivers. More on that in a moment. At first glance, the only thing that sets the V7700 apart from a plain vanilla GeForce2 is its unconventional round main-chip cooler. It's a neat little unit, though it doesn't have the ay-caramba impact of the Leadtek card's (comparatively) gigantic slab of aluminium. A closer look at that cooler, though, reveals that the fan's got three wires, instead of the usual two. This is because the V7700, like various other recent ASUS cards, has a hardware monitoring chip on it. In this case, it lurks on the reverse of the card, leaving the card layout practically identical to that of the NVIDIA reference design. The hardware monitor lets the card keep tabs on its supply voltage, main chip temperature and fan speed. Hardware monitoring is a handy feature, because it lets you see whether components are being barbecued or under-powered, and can also alert you to annoying fan failures. And ASUS include a utility called SmartDoctor that lets you do all of this and more. SmartDoctor is actually capable of dynamically changing the clock speed of the card in response to its temperature and what you're doing, so overheating the card's prevented, by slowing it down. But this isn't the power user feature that it might seem. Many people's computers have crummy ventilation. One fan in the power supply, a random snarl of cables inside, and inadequate front panel vents add up to little airflow, and an interior temperature a long way above ambient. Drives, the processor and sundry other components all contribute heat to the air inside the computer, and the less air flows through the case, the higher the temperature gets. Heatsink-and-fan chip coolers can't cool the device to which they're attached to a temperature below the temperature of the air that surrounds the cooler. Hey, don't blame me; if Isaac Newton hadn't come up with those annoying laws of thermodynamics then we could get around this problem, not to mention make perpetual motion machines, and probably stop daylight saving from fading the curtains, too. You mark my words. Ahem. Anyway, the hotter the air in a computer is, the less effective a cooler that has to use it will be. Even giant coolers like the one on Leadtek's board won't help much if they've only got hot air to work with. The hotness of the average computer case can lead to overheating problems, especially when people start overclocking their hardware. The faster you run a chip, the more heat it'll generate. Get it too hot and the device will stop working. 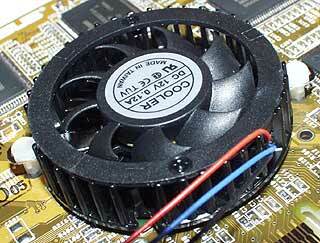 The same problem can arise if the cooling fan fails. Small fans like the ones on these video card coolers spin much faster and have rather shorter lifespans than larger models; many small fans last for years, but not all of 'em do. Now, overheating a chip doesn't mean it'll be fried. Almost always, it'll just shut down and crash the computer before it reaches the burned-alive stage. But crashes are bad enough. Obviously, though, SmartDoctor can't wait until the card gets so hot that the computer's likely to crash, before it reduces the clock speed. That'd defeat the reliability-enhancing purpose. It has to use a reasonable margin. If the temperature where the card would go flaky is, say, five degrees warmer than the temperature at which SmartDoctor applies the brakes, then you only benefit if your card would, in fact, get too warm. SmartDoctor has no way to tell whether your particular setup would run the card only a degree and a half above the slow-down temperature, and be perfectly stable. There's input voltage checking, too; SmartDoctor will obligingly warn you if your AGP power supply isn't up to scratch. It does this, though, by switching focus away from whatever 3D program you're running and popping up a warning. If a program isn't able to switch to the desktop properly - which is the case with a lot of games - then SmartDoctor may make demons fly out of your nose, for all you know. You can get, for instance, an illegible white box intermittently flashing up on the screen. Or just a hung game. The cure, in this case, may well be worse than the disease. Slightly out of spec AGP power is common enough and probably not dangerous. Badly out of spec AGP power can crash your computer; older and/or cheaper motherboards with cheap linear regulators for AGP power just can't run modern 3D cards, because the regulator can't deliver enough juice. But, again, SmartDoctor doesn't trigger when the voltage is way too low, because if it did then it'd probably be too late. It has to trigger when the voltage is just a bit low, and the result can be nuisance warnings on systems that don't actually have a problem at all. SmartDoctor can also partially shut down your CPU when it's idle, which saves a small amount of power and further reduces case temperature. If you ask me, idle CPUs are just something to run the Distributed.net client or SETI@home on, but to each his own. You could be forgiven for thinking that SmartDoctor was an automatic overclocking system - that it dynamically wound up the card clock speed to the highest setting that wouldn't overheat it, and then jockeyed it around to keep under the temperature limit. ASUS promote it as "dynamic overclocking", after all. But SmartDoctor doesn't actually know how to increase your clock speed until the card runs too warm - it just runs at the maximum speed you've set manually, and reduces the clock speed if a given temperature limit's exceeded. ASUS provide a separate tweak utility that lets you set the core and memory clock speeds for the card; whatever you set there is the fastest speed you'll get. SmartDoctor can also reduce the clock speed below the GeForce2 default of 200MHz core, 333MHz RAM - "underclocking". You can tell to do this when nothing's happening that needs the full card power. When the system's idle, SmartDoctor sets the card core and memory clock speeds really low, when you're running a 2D application it sets them a bit higher, and when you're running a 3D program it turns the wick up all the way. ASUS say SmartDoctor's non-3D underclocking features are there to save a little power, and maximise the life of the video card. This is all very well, I suppose, but the expected lifespan of any video card running at its stock speed is pretty much the same as the expected lifespan of a CPU - in other words, it'll normally last until it's worth nothing. I'm unconvinced that running a video card slower than its stock speed makes any useful difference to its lifespan or reliability. And since you can't wind up the supply voltages of the GeForce2, you're not going to be overclocking it tremendously. Voltage-boosted CPUs may have significantly shortened lifespans even when correctly cooled - although I haven't seen any evidence to that effect - but when you're still running at stock voltage, pumping up the clock speed doesn't do much to the hardware, other than make it unreliable if you've set the speed to high. Leadtek might not be an internationally renowned super-brand, but their driver team demonstrably has its act together. The drivers that ship with their cards always seem to be good, and updates are released frequently. ASUS, on the other hand, is more lackadaisical. The drivers that come on the V7700 disk are based on the somewhat elderly v5.16 reference drivers. Which aren't really reference drivers, since NVIDIA never officially released them. But they were leaked, as have been various later versions, and they're available all over the place. If you want to use the ASUS branded drivers, these 5.16 ones are it at the moment, except for the "5.16d" beta drivers available from the ASUS download page here. This wouldn't be a problem, if the v5.16-based drivers were as fast as Leadtek's, but they aren't. I checked both cards out with Quake 2 in 1280 by 960 resolution, 32 bit colour, using the lightweight standard demo2.dm2 demo. This ensures that the CPU's lightly loaded, but the graphics card's got plenty to do. At stock speed (200MHz core, 333MHz RAM) the Leadtek using the current v1.03 drivers (which are faster than the v1.02 ones that come on its driver CD) scored a most imposing 93.3 frames per second on my 800MHz Athlon test box. Overclocked to 219MHz core and 396MHz RAM (9.5 and 18.8% overclocked, respectively) it powered up to 112.6 fps - a respectable 20.7% faster, and a reasonable approximation of Ludicrous Speed. I like the Leadtek. It makes me feel more of a man. For some reason, the V7700 defaulted to running at 201/337MHz, though clicking the "default" button in its clock speed tweaking utility set it back to 200/333. At the slightly elevated "default" speed, its score for the Quake 2 test was a comparatively miserable 70 frames per second. Which meant it was beaten by a full third by the Leadtek, despite being clocked a hair higher. The ASUS speed tweaking utility's sliders go only to 220MHz for the core and 364MHz for the RAM (10% and 9.2% overclock, respectively), which makes a bit of a nonsense of the SmartDoctor auto-slowdown feature, I think. The card behaved itself perfectly wound up to this maximum speed, but only made it to a lousy 75.3 frames per second; 7.6% faster than its stock speed result. Testing with Quake 3 in 1280 by 1024, 32 bit everything, using the standard Demo1 demo, showed a smaller difference between the two cards. At stock speed, the Leadtek clocked in at 39.9 frames per second, with the V7700 close behind at 39.5. This is, I think, mainly because the standard Quake 3 demos are of fairly hectic multiplayer action, and this and the more complex engine load up the CPU more and squelch out driver differences. Quake 2's stock demos are of single player games, without a whole lot happening, in comparison. The overclocked Quake 3 results were more different, as you'd expect given the lower overclock limit from the stock V7700 software. 46.6 frames per second for the Leadtek, 43.8 fps for the V7700. I had to choke back the Leadtek card for the Quake 3 tests, because the heavier load from the more complex engine (I suppose) made the 396MHz RAM setting too high, and created a sprinkling of white pixels as data was mis-read. It still seemed stable enough, and managed 48.3 frames per second, but it was unsightly. Winding the RAM back down to 383MHz cured the problem (a pixel glitch or two still popped up now and then, but I had to look hard) and gave the 3.6% lower result. Which was still 6.4% faster than the V7700 could manage. This small a difference doesn't really matter. You generally can't perceive performance changes of less than 10%. But I still wanted to see better performance out of the ASUS board, so it was time to give the stock drivers the boot. SmartDoctor can do its thing even if you use different drivers, so that's OK, and this card doesn't have any extra frills to worry about. I downloaded the latest leaked NVIDIA drivers, version 5.22, from Reactor Critical and installed 'em, then tested the V7700 again. Needless to say, twelve bloomin' hours after I finished this review, NVIDIA released their official "Detonator 2" v5.22 driver set, with, of course, support for the GeForce2. You can download it from them here. And, about ten seconds later, ASUS released updated beta drivers for the V7700, here. Unfortunately, the results weren't much better. A lousy 69.3 frames per second in Quake 2, and 42.5 in Quake 3, at the stock clock speeds. Which was a hair slower for the simpler game, and only 6.5% faster for the more complex one. By using a simple registry patch like this one, you get access to the standard NVIDIA overclocking panel, which lets you wind the core speed up to 250MHz and the RAM speed up to 420MHz. Well, it lets you try to overclock that far, anyway. Think of it as being like a speedometer that goes up to 250 kilometres an hour but is on the dash of a 1.3 litre city car and you'll get the general idea. Getting to the setting-changer's a bit of a pain, though. You've got to go to Display Properties -> Settings -> Advanced -> GeForce2 GTS -> Additional Properties... -> Hardware Options to get there, and you've got to restart once to make clock-tweaking available, and press a silly Test New Settings button every time you change the clock speed, even if you're reducing it. But at least it lets you crank the clocks past the excessively conservative limits set by the ASUS overclock utility. The maximum speeds for the V7700 turned out to be similar to those for the Leadtek. 225MHz core, 396MHz RAM was pretty much the ceiling, though once again this RAM speed was too high for Quake 3. This time it wasn't just twinkly pixels; it rapidly degenerated into the rather more serious graphic corruption that usually means your computing session is about to kiss its behind goodbye, but which didn't actually cause a crash this time. Again, winding the RAM down to 383MHz cured the problem. At 225/396, the Quake 2 demo managed 76.2 frames per second, and at 225/383, the Quake 3 one did 47.4. Again, a tad better for Quake 3 (beating the Leadtek's overclocked result by only 1.7%), and well below par for the simpler Quake 2. The overclocked Leadtek using its 1.03 drivers beat the NVIDIA 5.22-drivered V7700 by nearly 50% for Quake 2. If you activate the SmartDoctor thermal protection and the card gets hot enough for it to kick in - as it did, during my testing - it seems to select a very low clock speed. It might be using the relatively glacial setting that's normally used when the computer's idle; maybe it's using the somewhat faster 2D-application setting. This is fair enough, as the aim of the exercise is to cool the chip as fast as possible. But the clock speed chop causes a big performance hit, easily halving the frame rate if you're running in a high-ish resolution. It's very noticeable, and it's not nice. Now, suddenly visiting Stutter-World is a lot better than just crashing completely. But when you remember that the card might not be on its way to a crash, but merely have crossed SmartDoctor's temperature threshold, the advantage isn't so obvious. I turned the thermal protection feature off and kept on trucking; crashes came there none. About all the V7700 Pure has going for it is the hardware monitoring, and frankly, I can take it or leave it. If you've got a computer with poor ventilation and don't care to improve it, SmartDoctor will at least save you from system hangs due to heat. But, if you ask me, it's a better idea to open your case up a bit and get some cooling air through. Then, if overclocking appeals, wind your video card up as far as it'll go without glitching or crashing, back off a bit from that extreme setting to give it some leeway, and forget about it. If your ventilation's good enough, you won't have a problem. The fan failure alert is a nice feature, though. There's no easy way to tell when a video card fan bearing's seized, or the fan's been jammed by an errant cable, or something. You just end up with a computer that runs for an unpredictable amount of time and then crashes, over and over, and unless you pop the hood and specifically check out the video card fan you'll go bananas trying to figure out the problem. The CPU idling feature of the ASUS software, in comparison, is nothing that you can't do with utilities like the inventively named CPUIdle. CPU idling can be a trap, too; it mean your computer won't overheat when you're doing boring 2D stuff and your cranked-up processor's idle nine tenths of the time, but will overheat in short order when you run a 3D game and suddenly the CPU's never idle. In a poorly ventilated case, the heat from the CPU can make a significant difference to the inside temperature, and that's assuming that the CPU itself doesn't overheat. Now, the V7700's Quake 3 performance with the 5.22 drivers is fine, and it's likely to do just as well with other demanding games. And its Quake 2 performance isn't rubbish; it's just not nearly as fast as it could be. And it seemed perfectly stable with the ASUS or leaked NVIDIA drivers. New graphics cards often have drivers that aren't just slow, but also cause crashes. I don't think this is likely to be a problem with anybody's GeForce2 offerings, since the NVIDIA drivers on which all of the other driver packages are based are quite highly evolved. If the hardware monitor and related features of the V7700 turn your crank, then by all means get it. It's a perfectly decent performer if you use the leaked drivers, it's not much worse with its stock drivers, it's stable and well made, and it's not painfully expensive. Well, not by GeForce2 standards, anyway. But I'm sticking with my Leadtek. No frills, solid drivers, slightly cheaper, and the low-tech solution to chip cooling - a big butch heatsink. If someone made me use a V7700, I wouldn't mind at all. But I think the Leadtek's the better card.